Think of all the things we would have never seen without photography or the entire web for that matter. Maryland Federation of Art thinks that the digital world is all around us, and it’s our mission to transform it into art. Deadline is November 15th, and you can visit this link for more information. The Maryland Federation of Art (MFA) has been invited to exhibit artwork at the Lowe House of Delegates Building in Annapolis, Maryland. Original 2-D and 3-D work created through any media and following entry guidelines are eligible for entry. Exhibiting artists must be either MFA Members or Anne Arundel County residents. The selected works will be on exhibit at the Lowe House of Delegates Building (6 Bladen Street, Annapolis, MD 21401) tentatively from January 16, 2018 – April 13, 2019, while the legislature is in session. Deadline is November 30th, and you can visit this link for more information. Please note that the Cumberland Valley Artists and Cumberland Valley Photography are two separately juried exhibitions. However, deadlines and guidelines are the same for each. Application Fee: WCMFA Members pay $12.50 per entry. General public $15 per entry.Deadline: November 16, 2018. The Morris and Gwendolyn Cafritz Foundation Arts Center has a number of spaces available for mounting exhibitions that support the academic mission of the Department of Visual and Performing Arts. This open call is for our King Street Gallery, the largest exhibition space in the Cafritz Arts Center. This light filled, 1050 square foot gallery is in the main atrium of the building. Its prominent location, open design, and extremely high ceilings (30 feet+) make it a great venue for major exhibitions. While much of this gallery space is visible from the main lobby of the building, and through the windows that front onto the street, it does maintain gallery hours and is locked after hours. The gallery hours are Monday–Friday, 8 a.m.– 4 p.m. Exhibitions are generally scheduled a year in advance to compliment the academic calendar. Exhibitions in the King Street Gallery are 4-5 weeks long, and emphasize two person or small group shows. Single artist applications may be paired with a complimentary artist or artists to better utilize the space. Curated proposals are encouraged. The Capitol Hill Art League presents its Winners’ Circle Art Exhibit November 13 – December 5, 2018 at the Capitol Hill Arts Workshop, 545 7th St, SE. The show features the winning artists of past Capitol Hill Art League exhibits. The opening reception is Saturday, November 17, 2018 from 5:00-7:00 p.m. General gallery hours are: 9:30 am–9:00 pm (M-Th), 9:30 am–6:00 pm (F), and 9:00 am–2:00 pm (Sat). Free and open to the public. For more information, visit www.caphillartleague.org or call (202) 547-6839. Instructor Carolina Mayorga leads a three-week Shadows & Light Workshop on Tuesdays, November 27-December 11, 2018 from 6:30-8:30 p.m. at 545 7th St, SE. Explore some of the most relevant artistic styles in art history through drawing and mixed media assignments that incorporate different concepts, materials and techniques. Tuition is $120. 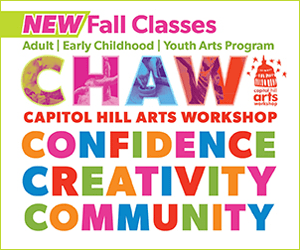 For more information or to register, visit www.chaw.org, or call (202) 547-6839. Join instructor Ellen Cornett for Paint & Sip, an evening of art and fun on Friday, November 30, 2018 from 6:30-8:30 p.m. at the Capitol Hill Art Workshop (CHAW), 545 7th St, SE. Receive step-by-step instruction as you create your own masterpiece while enjoying refreshments. Cost is $30 and includes all materials. Please call (202) 547-6839 to register (space is limited and pre-registration is required). For more information, visit www.chaw.org, or call (202) 547-6839.